The plan is to camp close to the border town of Irkeshtam (11km; 158m), but the village emerges out of nowhere before we find a suitable spot. It is a strange and eerie location reflecting a transient, makeshift life. Rusted, beaten-up trailers systematically fill the dusty patch captured in place by a river to the north, border boom gates to the east and barbed wire running the entire southern length. The small farming village of Nura lies immediately west. It is not a pretty sight, but behind this facade, the place is full of truck drivers and their families and they all seem friendly enough. They certainly love having their picture taken, which keeps us occupied for the afternoon. We arrive early and both hotels are full. They offer us the storage room off the back of the kitchen, which is okay for one night, though hardly the privacy, nor amenities you would expect for the 100 som each that we pay. There is no running water in the whole compound and it never ceases to amaze me that while this simple necessity of modern life is a rarity in Central Asia, whopping large sky dishes and flatron televisions are not. It is Sunday and we have to wait until tomorrow to cross into China. This is going to be a rather tricky exercise since the Kyrgyzstan gate opens at 9.00am and is two hours behind Beijing Time. In other words, it will be 11.00am on the Chinese side and seeing as this border closes at 12.00pm, we have exactly one hour to get in and out of Kyrgyzstan immigration and customs; ride 7 kilometres through no-man's land; pass two checkpoints; climb up a small incline and go through the immigration procedures in China. Ali and I get through the border process easily, but Sandra has a little more difficulty. Except for the Osh border where we entered Kyrgyzstan, most officials neglect to stamp travellers passports, often using the excuse that they don't have a stamp. This can become a problem when leaving the country. Of course, it is useless trying to explain that it is the fault of the Kyrgyzstan customs at the other end. Luckily, after talking to colleagues and a bit of waiting, the border control official finally lets Sandra pass. We hit the first check point at 11.30am Beijing Time and the guard purposefully holds onto our passports for an unnecessary amount of time. He probably wanted an 'extra page' [some money] in the passport. We don't do bribes. Even after badgering him about why he won't give us our passports back, he still stands firm. So do we, right smack bang in the middle of the road, so no-one else can pass through. Judging by the toots, they too are in a hurry to get to the border before it closes. We remain put until he releases them from his hold 12 minutes later. We push on up the hill as fast as we can pedal and land at another, less hassle checkpoint before flying down to the Chinese border crossing. We arrive at exactly 11.55am with five minutes to spare before closing. Getting through is relatively easy, very professional in comparison to recent experiences and everyone is amazingly pleasant. I even receive the compliment of the month when the customs officer genuinely comments that I look so much younger than my age in my passport. So, that is me set for the day. Even the threatening thunderstorms we later encounter down the road, can't wipe the smile off my face. The landscape is stunning in colour and wilderness. Sharp toothed mountain ranges point directly into a temperamentally clouded sky. A red silt river runs with us for practically the whole journey. At exhilarating speeds, a tail wind not only pushes us downhill but also edges us up and over the inclines. Just before it really starts to downpour at 4.00pm, we make it into the community of Ulugqat (55km; 494m), where a rather dirty room with three old iron frame beds is offered to us for 30 yuan [10 yuan = 1 euro] for the night. The township toilet is not even half star quality and is our first introduction to the communal Chinese loo. It lies directly behind the open air butcher of an unfortunate wooly friend. Electricity comes on after 6.00pm. Restaurants are in plentiful supply though take the form of someone's living room turned into an eating place. It doesn't take long before we find one that will cook us a vegetarian meal. It is tasty and satisfies the spot that didn't really get filled up at our earlier pause for lunch in the village 20 kilometres after the border. We retreat back to our room and are all contently reading when a loud rap at the door interrupts us. It is two local policeman: an older more official looking character with a younger, lesser rank and obvious spokesperson for his boss. "Passport" is the first word uttered and we immediately respond with "Why?" This always stumps them and they stand bewildered for a moment before continuing on with forbidding us to show our books to the local people of the town. Seeing as no-one can speak English here, let alone read it, I doubt there will be any problem with us obeying this request. Anyway, we tell them we have no intention of allowing our English words to be scanned by the eyes of Ulugqat residents. We are also informed that we must move on tomorrow and while we can all barely refrain from laughing at the preposterous suggestion that someone would want to remain any longer in a place like this than absolutely necessary, we thank them for their concerns and bid them good night. Officials at the checkpoint up the road are too busy reading the morning newspaper to notice us slip through. We ignore the whistles as they realise too late that they have let three foreigners on bikes slip through without registration. Again, the views are just as spectacularly as yesterday, though there's a dryer element about what we see. A few camels are present. I find it all quite remarkably striking and it does make me wonder why so many have commented that they found the area boring. "Chinese Desert" is what I heard a few times with a tone lacking any enthusiasm. For a desert, there is bountiful water supplies along the entire stretch of highway into Kashgar. And should you really need assistance in any way, there are always plenty of road workers or traffic to help you out as well as a scattering of small villages lining the route. The road is definitely not flat. It undulates its way from Ulugqat to Wuqia in grand style and if it hadn't been for the strong wind from the back, the climbing would have been quite difficult. Some parts of the road are not so well bituminised, which means coasting down was not always at the desired speed. Still, after the road we experienced from Sary Tash to Irkeshtam, no-one is complaining. We arrive in Wuqia (96km; 985m) at 3.00pm and find the first hotel we stumble upon a little expensive, so we try the next. The receptionist here looks at me as though I'm the lowest life-form on this planet and before we know it, she's rung the police and there are six of them around us. An interpreter is also found because no-one speaks a word of English. Passports are thumbed through several times, temporary residency forms need to be filled in and in total, two hours of absolute nonsense passes before they try to hit us with an extra 200 yuan deposit for the room. This sort of money we simply don't have and there are no ATM's or banks available to issue us with any cash. We all agree that the friendliness factor at this hotel scores a figure well in the minus range and a mutual decision is made to head back to the other - more expensive - hotel. Here, they don't ring the police nor is there any fuss when we explain that we don't have money for a deposit. The room too is totally fabulous: all the mod cons and super clean. Extras include a toothbrush and toothpaste, toilet paper, shampoo, shower gel, running hot and cold water, as well as a television, electric kettle, tea bags and the most comfortable bed with white crispy linen that smells like heaven. By the grins on our faces, it is not hard to tell that we have been deprived of a little comfort of late. The restaurant next door to the hotel cooks us our first feed of fresh green vegetables in I don't know how many months and it is more heavenly than those white sheets. If you are stopping in Wuqia, then there's also an internet cafe, which is the first cyber connection we have managed to find since Osh in Kyrgyzstan. The road from Wuqia to Kashgar is almost downhill the whole way. We fly along even though a headwind stops us from making record speeds. Still, the 23.3 kilometre per hour average is enough to get us into Kashgar well before 3.00pm. At the start of the day, mud housing with carved wooden entrances dot the roadside in a rather desert like landscape. The rest of the scenery is not so entertaining in the initial stages. From the Torugart turnoff onwards the roads are simply superb with their wide shoulder for slower moving traffic. At some stages, we reach flying speeds of 45 kilometres per hour: one of those fabulously invigorating rides. Soon enough, tree lined streets and small villages envelope the surroundings. Vibrant markets and adobe houses with ornately carved doors and colourful fresco paintings keep us engrossed until we hit the highway. Immediately, we are captured by another atmosphere as we enter Kashgar (97km; 319m). It is more civilised. It is the big smoke. it is not at all difficult to find the cluster of hotels on Seman Road, where every foreigner stays and every taxi driver knows how to get to. We choose to stay adjacent to the infamous Seman Hotel, which judging by its enormity could cope with the entire Kashgar tourism trade by itself. Hotel Sahar is half the price at 80 yuan for a double room and although it is not where the Queen would want to stay, it is okay by our standards. Facilities include own bathroom, running hot and cold water, both for washing and drinking, fan, television and if you are polite and friendly, then the staff are exactly the same back. We frequent John's Cafe [located at the back of the Seman Hotel] every morning for breakfast. Although a well-designed snare for westerners, it is a great place for meeting other travellers and just chilling out in the later part of the day when the blistering sun gets a little too much. The staff are really friendly which is an added bonus. Emerging from this sanctuary a couple of afternoon's later, we spy the infamous white Nissan Patrol from Urs & Jonas, two German guys we met in Osh. The Torugart pass roads have had their toll on the tyres: one is completely flat and the other blown beyond repair. Their restrictive travel adventures in China keep us well entertained, but we are glad we are on push bikes. It is the only unrestricted mode of transport in this country. With a vehicle or motorbike, you are not allowed to go anywhere without a guide and a leading car, which means your itinerary is fixed and it costs you a wad of money to do so. Kashgar has quite a modern facade and enough fashionably dressed individuals prance the boulevards with plenty of ready money to spend in the cluster of beauty, clothing and shoe shops. Behind the makeshift barriers, there is another life. The Uyghur families living in their half houses; still hanging in there until the inevitable happens. Until their mud brick house is demolished to make way for new more prestigious buildings. 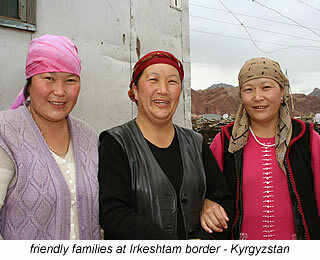 These people are more akin to the Central Asian ways rather than China's stereotyped culture. There is an apparent line drawn between the two communities. The Uyghurs make up a large percentage of the street beggars and Kashgar has its fair share of them. Still, it makes no difference to the hospitable atmosphere in this city for the average tourist. 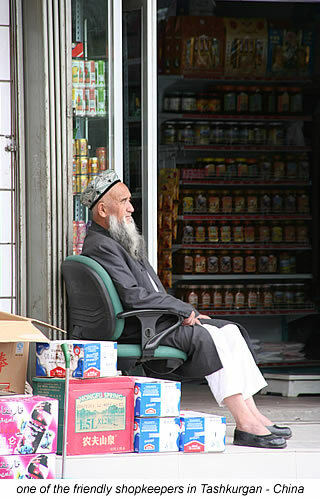 There are plenty of hello's, smiling faces and helpful shop-owners to make your stay in Kashgar very pleasant. One of our missions, besides filling our stomachs with decent food after Central Asia is to find a bike shop. Surprisingly enough, after several long walking attempts we find two: a Giant store which stocks quality parts and accessories; and 500 metres or so further down the road and on the other side is a Merida store. For other small fix-it jobs, you can try your luck with one of the numerous bike repair places around town. The guys on the corner below the Sahar Hotel seem to know what they are doing and are never without a customer, which is an advertisement in itself. 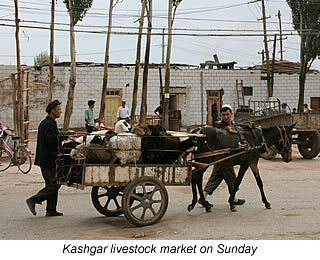 Probably the most frequented attraction on Sunday's in Kashgar, is the livestock market. Taxi fare is around the 10 yuan mark and though not the spectacular scene promised in guide books or by locals, it does have a very unique ambience to keep you and every other tourist in town entertained and snap-happy for a few hours. Everyone then ventures to the normal Sunday market, where you can buy everything and anything. Make sure you barter though: prices can be outrageously expensive on first quote. Much to our delight. we bump into Trish & Paddy in the foyer of Seman Hotel. We had previously met in Samarkand and Tashkent. 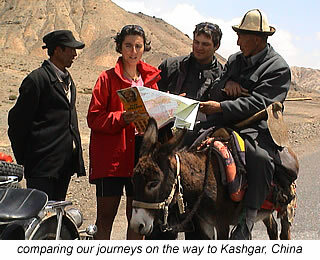 Kashgar is just one of those crossroad places where you are bound to catch up with fellow travellers. It is here too that we briefly get introduced to Peter Gostelow, Tim Brewer and Stephan Störmer as they leave for Lhasa with Sandra. We spend many an hour in John's Café chatting and in the famous multi-coloured flagged Intizar Restaurant eating. Here we also meet up with Keith & Meredith in a large loaded cycling group about to set off for Osh. 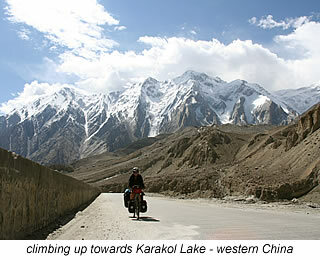 We depart a few days later for Karakol Lake and the long awaited ride along the Kharakorum Highway. This is the start of the Karakoram Highway (KKH): one of our all time cycling dreams. After a well earned rest and full digestive recuperation in Kashgar, we set off south, with great enthusiasm, towards the Pakistani border. Does a donkey s**t on the road? The morning of our departure and a storm brews. Rain and wind ground us in Kashgar till almost lunchtime. We follow the road out of town and village life seems to continue forever. We hit the township of Shufu - 16 kilometres from Kashgar and the road begins to climb ever so gradually. We have headwinds which is not particularly pleasant, but the road is fabulously smooth and there is relatively little traffic. There is not too much to see apart from the numerous townships we pass through over-populated with donkey drawn carts. Consequently, you have to dodge the overwhelming amount of donkey poo lining the roadside. Opal is the last big village we see. It is 48 kilometres out of Kashgar and has everything you could possibly want in the way of food and drinks. Spectacular red mountains are directly in front of us, but the gloomy weather view drowns any enjoyment. The sun tries to break through on occasions but with no luck either and we pull off to camp by the river near Oytaq (86km; 546m), just before it decides to rain. In true Central Asian form, we open the tent to see a man squatting directly above, on the side of the road just staring at us. He remains fixated with every move we make for an annoying amount of time. I haven't fully woken up yet and retaliate by zipping up the tent putting me and everything out of his sight. He eventually leaves and I finally wake up, but we see him 300 metres further on, doing the same thing. We later work out that he is staring at the the three Russian cyclists that we later meet on the way. He must have thought there was a foreigners invasion. No wonder he was checking us out. Just up the road is the tiny village of Oytaq, where you can purchase basic vegetables and other food supplies including what I have nicknamed the Chinese bagel rock. As my name suggests the outside is incredibly hard and impossible to break open without using a knife. The first time I bought some, I honestly thought the woman was trying to sell me stale bread. Inside it is compact tight dough which makes for a longer chewing session than normal, but they are quite tasty when you get used to them. They usually cost ½ yuan each. I buy six, some string beans and tomatoes. Not even a kilometre after our purchase and Ali discovers he has broken a spoke. While repairing the wheel, we meet Alexander, Anatoli and Benjamin. They have cycled from Samara in Southern Russia and intend to reach Tashkurgan before turning around again and going back home. Benjamin is about to turn 70 years of age and while their speed is considerably slower than ours, it is quite remarkable to see their biking enthusiasm in this challenging terrain. As I am truing Ali's wheel, maddeningly another spoke breaks. The ascend to Ghez begins almost immediately and we reach the checkpoint station after 39 kilometres and 600 metres of climbing. There are some relatively steep sections along the way, but the roads level off at regular intervals to give you the chance to energise enough to face the next incline. Ghez also has snacks and drinks available. To one side of us a river gushes past and you can't help but imagine its supreme power in Spring. Huge stone cliffs tower above us and radiate red against the perfect blue skies. Echoes of the torrent ricochet across the gorge. Directly above and through squinted eyes glaciers shine a blinding silver light as they peak out from the cloud cover. It is mind-blowingly beautiful. Adding to the beauty of this trip is the immaculate condition of the road. Except for a handful of patches, where the river obviously floods, it is the best road we have ever cycled on. Yes, including in Europe! While the Chinese haven't quite got the knack of building sturdy enough road signs yet, they are champions when it comes to laying bitumen. Over the next 12 kilometres, we traverse a tiring 400 altitude metres. Near Ghez (52km; 1060m) we find a semi-secluded spot in a quarry overlooking the day's uphill path and edging the magnificent snowcapped summits of some of the highest mountains I have ever seen. We are but a dot in the perspective of this landscape. Headwinds, side winds and every other possible wind tries to foil today's journey. We start the morning in intense sunshine and have to climb 600 metres or so as we wind up and out of the valley. After 16 kilometres, we reach the turnoff to Maji - 28 kilometres from Ghez - and view the rather out of place sand dunes before us.The KKH has a forever-changing landscape which means by the end of each day, it is quite difficult to recollect everything you have seen. Today the weather emulates this phenomenon as well and just past Bulungkol - a speck of a village full of touristy souvenirs and little else - a sand storm blows unexpectedly in from the side. As soon as we have safely made our way out of its violent force, the temperature drops instantaneously from 25°C to 8°C in a matter of minutes and it begins to rain. At first only a spattering of drops but we are soon cycling in a full-fledged storm and grateful for the road workers camp just up the road, where we shelter in a cabin, next to a delightfully warm pot belly stove. Unfortunately, the employees don't speak any English and our Chinese is just as good, so the next 15 minutes are spend in relative silence. The storm disappears as quickly as it had appeared and we are soon pedalling off in glorious sunshine with the monstrous Kongur Shan [7719m] mountain to our left. We estimate that Karakol Lake must be 10 kilometres from here and while the first five are reasonably flat, the last five are a long and winding grind to the 3683 metre high pass. As we near the top, the famous peak of Mustag Ata [7546m] comes into full view. A spectacle worth every inch of pedalling. The translation speaks for itself: Father of Ice Mountain. He remains in our sight for the coming days. As we round the bend at Karakol Lake (55km; 1104m), we are literally accosted by the first set of yurt owners to come and stay with them. Considering the strong likelihood of rain, we accept. Finally, we get to stay in a yurt and after the experience, all I can say is give me a Chinese hotel for the same price any day! [30 yuan per person]. It is way more comfortable. For a start, a yurt has a tendency to leak when it rains and I spend a good part of the first night wide awake listening to the irritating sound of water dropping on the carpets around me. Naturally, it is made out of animal hide which leads to a musty, dampness that constantly fills your nostrils and when it is cold outside - which it is while we are here - it is also freezing in the yurt. They usually have no electricity or heating possibilities either. Adding to the lack of luxoury, there are no bathing facilities either. Furthermore the toilet - if you can call a dugout catchment area full of human waste underneath a portable cabin with a hole cut in the floor, a toilet - is a reminder of how differently the west handles this aspect of human nature. Anyway, we sleep in until 11.00am Beijing Time and obviously the rest is required by our exhausted bodies. Even with all that sleep, I arise with a migraine headache; partly sunstroke, partly windburn and partly the high altitude, I guess. It nags me incessantly all day and I can hardly do anything other than lie horizontal and try to sleep. I manage to drag myself out of the yurt to cycle with Ali up to the next village and see if there are any food supplies worth acquiring. There is, however, little else than a few tin shack stores with biscuits and snack items on sale. Even though we had enquired after a shop the day prior, we find out upon our return that there is a yurt just a few 100 metres from where we are staying selling food and other goodies. While the whole Karakol Lake set-up looks traditional, it is really a well thought out tourist attraction trapping more and more visitors each year. Bus loads of snap-happy travellers are dropped off for 20 minutes to part with their money for horse and camel rides or supposedly traditional handicrafts. We have been warned that if we set foot on the road used by the tourist buses and leading directly to our yurt, we will incur the cost of an entry ticket. Alternatively, we are supposed to use the less refined route, across unpathed rocky terrain and past the toilet stench. At the toilet, there is a long line of women with face masks. The Chinese are big fans of the white mask and gloves. They wait patiently for the use of the toilet, while the men unashamedly walk within a 50 metre radius of our yurt, drop their trousers and do their business on the pasture. They even take landscape photographs during the process. Talk about multi-tasking! I decide against either of the above options and head towards the overflow tunnel. Unfortunately, I'm not the first person who has taken this initiative and I'm forced to tippy-toe through a 20 metre stretch of human excrement before exiting on the other side and finding a much safer zone. Further on down the road, also renowned for it is disgusting amenities, you can't miss the Karakol Lake Resort. Its pompous gateway with cordons and signage demanding cash to enter the premises are sad evidence that this is purely a money making scheme. And beware, if you happen to wander close to this zone while strolling at any time of day and from any direction, management will try and get a 50 yuan fee out of you for simply looking at the lake. Campers around the lake will undeniably be hassled too and we spoke to a few travellers, who parted with 25 yuan each for setting their tent up on the grassy banks of the lake. You can eat in the yurt for 10 yuan per person per meal, which is ten times the local cost of the plain, often stale, bread and pot of tea dished up for breakfast and double the street price for laghman [noodles with tomato, vegetable and mutton topping], served at dinner. Getting a vegetarian version is difficult, but with persistence it can happen. I think the most unpleasant part of all this is that your mealtime doesn't just comprise eating. We are forced to look at all the really cheap, tacky souvenirs the yurt dwellers have tucked away in little cardboard boxes. What's more, if you think after the first evening you are scott free since you have managed to convey that you are not interested in their wares, you are in for a shock. Without a doubt, the following evening you will be directed to another yurt for a similar dinner and the same rigmarole will start all over again. On the more inspirational side of things, the effects of tourism at Karakol Lake cannot take away from the absolutely stunning nature surrounding it. It is a photographer's and daydreamer's fantasy and you could click and stare away until the memory card is completely full. Each second sheds a new light, presents another cloud formation, emits fresh colour: forever captivating. After a rest day at Karakol, it is time to conquer the highest pass we have been faced with yet. Our aim is to reach Tashkurgan in one day but there is plenty of climbing to do at an altitude of around the 4000 metre mark. Headwinds again, attempt to thwart our plans and we struggle the first 23 kilometres of almost no gradient roads. The last 7 kilometres up to the pass, under normal circumstances wouldn't be a problem at all. They are an average of 5%, but the wind factor and the altitude make the ascend extremely difficult. It is essential that you find your rhythm in these conditions. The slower, Carpenter's version of "On top of the world" plays over and over in my mind as the pedals go up and down to the beat. I try and stick to it, but any interruption to this rhythm: a cough, the need to spit and you'll find yourself gasping for air. And I mean in a scary sort of fashion. It is almost like the body cuts out for a miniscule fraction of a second and just as the song says, with such a feeling coming over me, talking or drinking is virtually impossible. Unless of course you stop. Needless to say, this is a frequent occurrence over the one hour crawl until we are triumphant but out of breath, on top of the world. The reward of all the hard work is the view from Ulugrabat Daban [4098m] and the 30 kilometre downhill that follows. Even with headwinds, we manage 40+ kilometres per hour on roads as smooth as a baby's bottom. The landscape is desert-like until the valley of Tagarma. Here, the road levels out here and we are anticipating the steep climb mentioned in LP out of this basin. We continue to follow a downstream river and logic prevails: no scaling is necessary, unless you consider a couple of hundred metres at 6% incline, steep. Either the Chinese have blown up the pass and build a new road since the LP research, which is entirely plausible, or a novice researcher was responsible for handing over the rather dubious information. We fall into yet another valley and our destination can be seen way off in the distance. Ten kilometres later and around 6.30pm, we pedal into Tashkurgan (100km; 597m). The Traffic Hotel is dead simple to find. There are no double rooms available and we rent a 4-bed dorm at 15 yuan per bed for the first night. Showers are an additional 3 yuan per visit at a bath-house in the complex next door. We have been promised a double room for 80 yuan the following day. It is not a disappointment: clean and neat, though the bathroom is a little old and rusty, but you get a television, towels, a well pressurised hot water system with bathroom goodies to peel out of packets, a water kettle, tea and a bright and airy view out onto the main street. Can't complain for that price. The restaurant attached though leaves a lot to be desired. Food is oily, quite tasteless and overpriced. Ali develops bad stomach cramps after his first meal there and they remain for almost the entire length of our stay in Tashkurgan. Extremist hoohah in Pakistan: to see or not to see. Tashkurgan is definitely not a raging metropolis. In fact, it is quite lifeless, except for the shopping area situated at the township's crossroads. The town has a very laid back feel going for it, though you can get nearly everything you want here, providing it is still operating or not out of date. Photocopies are not available during our stay due to a malfunctioning machine and I wouldn't touch the tins of tomato paste with use by dates from early 2006 stamped on bubbled lids. On the other hand, there's a small fruit and vegetable market with reasonable quality products and extremely friendly shop-keepers. Additionally, on the corner diagonally across from the Culture & Art Museum, there is a small bike fix-it place selling spare parts as well. Though not top of the range, they would be a pleasant relief in a dire situation. The 220 kilometre stretch of no-man's land between Tashkurgan in China and Sost in Pakistan, is not an option to cycle and you must purchase a bus ticket at 225 yuan plus an extra fee of 50 yuan for each bike. It is rather pricey considering the 296 kilometre return trip to Kashgar from Tashkurgan is only 62 yuan. A good example of supply and demand. As far as we know at this stage, you are permitted to get off at the Khunjerab Pass [4733m] and cycle the 80 kilometre downhill journey into Sost. But whether we will take this route or not has been up in the air in light of recent bombings and attacks in Pakistan. Internet hasn't really been any help in finding out exactly what the situation is either. Frustratingly enough, no-one's commenting on LP's Thorntree so we came up with Plan B: return to Kashgar, get a visa extension for China and enter India via Tibet and then Nepal but this means some pretty full-on cycling at 5000 metres plus and an almost two day bus/truck trip. It is easy enough to extend our Chinese visa in most cities in China. They'll give us an extra 30 days. Permit's for Tibet can be obtained in Ali and a Nepalese visa for 60 days will cost us just US$30 at the border. Plan B is abandoned, however, after talking with an enthusiastic group of English travellers and a Swiss and German couple on bicycles, all entering Cina from Pakistan. The week's bombings and attacks in areas around Karachi, Quetta, close to Peshawar and in the NWFP, not to mention the landslides in North Waziristan, move the initial decision to leave on Saturday to Monday 23 July. By Sunday, all is a lot quieter. Unfortunately, our original route has been altered somewhat and more than likely we'll get on a bus for the KKH journey through the NWFP and strike Peshawar from the list of places to visit. Regardless, we are ready and feeling good about hopping over yet another frontier. 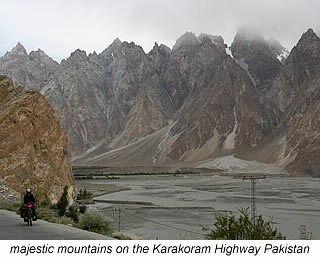 The Karakoram HIghway, a 1200 kilometre long stretch of road from Kashgar to Havelian, leading through some of the highest mountain ranges in the world, is renowned for its instability and landslides. On the Pakistani side, the mighty force of nature and the ever changing landscape must never cease to amaze locals and Chinese road workers alike. We wake early, pack and trundle 590 metres down the enormous, unused, double-lane highway towards the bus-station. At the depot you can purchase tickets in either yuan, rupees or US dollars. Though for the latter, expect a very bad exchange rate. Everything appears to be tip-top organised and we are through customs and immigration in no time. Getting our bikes onto the bus proves a little more difficult and although we have paid the extra 50 yuan for each of them, the luggage handlers are demanding an extra 10 yuan each to lift them onto the roof. Ali, together with a Norwegian guy faced with the same problem for his sack of mountaineering equipment, decide to do it themselves. The bus driver wants us to put all our Ortlieb bags on top as well, which I firmly object to. Basically, I badger the heck out of him till he opens the underneath luggage compartments. His idea of full is merely poorly stacked backpacks and suitcases and all bar our hand luggage, fits in with a little organisation and little effort. As for the guys at the ticket office: well, they have some discrepancies in their figures and take an extra hour head-counting, looking at passports, eventually collecting them up and then calling us onto the bus, one by one, while they tick-off names on their list. It is a bit like role call at school. Finally, the bus engine starts and we move about 300 metres down the road to the first of many checkpoints along the way. The first 100 kilometres or so is a very gradual uphill climb until you reach the Pirali Checkpoint. There is nothing much to comment on scenery-wise as it is quite barren and uninspiring. We are surprised by the obvious inhabitation of the area though. From then on, the gradient steepens as do the mountains to each side of us. The road becomes quite a climb as we pull into the second Chinese checkpoint, after 2 hours of travel. Then the lowest gears are necessary to cope with the switchback strain getting to the Khunjerab Pass [4733m]. A bit further on, we stop momentarily at the third post while Pakistani officials check through the luggage compartments. Whether the current situation in Pakistan has anything to do with it or not, we don't know, but security has been pretty tight for the entire length of the journey and head counts and passport perusal, full-on. The idea of cycling through to Sost doesn't turn out to be a feasible plan. There is absolutely no chance for us to leave the bus, the driver is in an obvious hurry due to a delayed start. Besides the weather is not the best and the road, though challenging, is quite an obstacle course. It seems the obvious threat around here is from landslides. Anyway, we sit put. What the rest of the KKH dishes up on the Pakistani side is absolutely wild and wooly and at times it feels as if you are in a quarry site for giants. I seem to be waiting for a monstrous foot to land next to the bus to put it all into perspective. But it doesn't of course and I spend most of the journey completely awestruck at the endless height of sheer faced mountains and the magnitude of damage the roadside rubble has caused. The roads are atrocious. In some sections there is barely enough room for the bus to pass as boulders as tall as two men have planted their broken edges firmly into the asphalt. Luckily, our driver is extremely competent, which puts us at ease. After six hours of driving and each having to hand over a $US4 fee to the Khunjerab National Park - that's roughly 240 rupees and nationals pay just 20 rupees - we finally arrive in Sost (1 bus journey of approx 220km). The usual border crossing humdrum begins. First a headcount and a passport check at the boom gate weighted by an old tin can filled with large stones is followed by a less than 50 metre ride to immigration. This procedure doesn't pass by without the usual forms to fill in and queues to wait in. Everyone is extremely polite and pleasant, which is pleasant. And you shouldn't be fooled by the amateur signwriting on the hand painted panelling dividing us from the officials as this is no indication of the level of technology at han. They have the latest computers, scanners and cameras in operation. Once everyone has their little stamp inked on the page, we all board the bus again for yet another ludicrously short journey down the road to Customs. This is definitely a backyard shack with a few armed officials, mostly Pakistani, roaming around checking boxes of Chinese produce. They are uninterested in our gear, but the luggage boys are on the roof before we know it and although Aaldrik does most of the work getting our bikes to the ground, they still try and hit us for a 50 rupee fee. We explain that if we ask them to do it, then we will pay them. A bit of an argument breaks out for a while until we both just walk off. An older man, who wants us to change money with him, knows of a place to sleep. In all honesty, you need no help in this department; there is an abundance of hotels in Sost to take your pick from. The man is so pleasant and gentlemanly, that we see no harm in looking. The room we are shown, though not the Hilton, seems fine enough for the 200 rupees they are asking. [80 rupees = 1 Euro]. I am however, once again fooled by the plumbing lines and taps into thinking that there is running water: this is disappointingly not the case. Furthermore, according to locals there has been no electricity in the town for 2 days. We later discover that this is a common occurrence in Pakistan and what with it getting dark at around 8.00pm now, there's little else to do than go to bed with the sun. The owner of the Pak Hunza Inn is a lovely guy and we are offered tea on arrival. "Salt or sugar?" he questions. I immediately take it for a mistaken "Milk or sugar?". It is a couple of hours later in the Asia Star Restaurant that I realise they actually do put salt in their tea in Pakistan. They also stick copious amounts of over boiled milk in it too, if you don't specify that you want your beverage "black". To the unaccustomed palate, well let's just say: "it's not really my cup of tea". Our hotel serves food as well and according to the man who guided us there, ordering vegetarian food is absolutely no problem in any establishment in Sost. After a quick wander around the town, we settle on eating at the Asia Star Hotel. They have an English menu with prices, plenty of vegetarian options and although it takes nearly 45 minutes to prepare, it is well worth the wait. Everything has been made from scratch and it is deliciously seasoned and really tasty. A filling dinner for two that night costs us just 90 rupees in total. The sun beams in so early that my alarm hasn't had time to go off before we are up and about packing bags and bikes. A two-egg omelette, fresh paratha and a few cups of tea for breakfast is a great start to the day and we are on the road by 9am. It is only a short journey to Pasu, but by the time we have cycled the first 20 kilometres, we are higher than when we started and have pedaled a total of 185 metres of altitude. Wild mint, lavender and camphor fill our nostrils as we push along the well surfaced road. The rest of the journey is undulating with a few steep 12% sections to battle with or conversely, glide down. The gentle downhill ride that is mentioned in our guidebook is total poppycock as there is nothing gentle about any of the gradients on this route. In fact, the average climb today is 3% which proves that point well enough. We come to rest in the early afternoon, at Batura Inn in Pasu (39km; 267m). The accommodation - 150 rupees for a double - is pretty grotty, dank and dingy, but Mr Baigs, the owner since its opening in 1974, is a sweet man indeed. There is no hot water, but at least the icy cold liquid flows out of the taps in the primitive bathroom facilities. Again - and you think I would have learned by now - the electrical cables in place dupe me into believing that a current actually runs through the wires. On the positive side, we enjoy a huge dinner of simple vegetarian fare and a great breakfast the next day before setting off. A small detail we have noticed in the last two days in Pakistan is that it is customary to order your omelette by the number of eggs you want in it. Well at least that is the case here in the north. And it makes perfect sense that this is the way you pay for it too. Your bill will say 2 eggs and not the expected, 1 omelette. One of the pleasantries in Pakistan is that, all of a sudden, the language barrier has been lifted and you can have an intellectual conversation with locals. Furthermore, the level is extremely high and everyone is so incredibly polite. I'm called Madam and Aaldrik Sir and when you ask a question, you get a sincere and detailed answer. It is a really lovely change and it has overtones of stereotyped British courteousness. We set off for Karimabad with an overcast sky above us, but by the time we get to the top of the rather easy 4 kilometre ascent out of Pasu, there is a blue horizon. A the top, we meet Olivier: cycling from Turkey to Kyrgyzstan. After an exchange of travel stories, road conditions and hazards, we sail down into Gulmit. Not being an avid trekker and having my time over again, I would choose to stay here instead of Pasu: it has a very comfortable feel about it. The next leg of the journey is a strenuous roller coaster ride and for every metre you fly down you need to pedal your way back up again. Sorry to get on the soapbox again but how the LP comes up with "The road is fairly level from Gulmit to Ganish" I cannot fathom. Again, the daily stats give a truer picture: 854 metre of altitude and a 4% average climb. That's hard work for anyone on a loaded bike. Maybe LP had a steroid boosted Tour de France cyclist doing their research on this stretch of road. They do get the bit about the potential landslides correct though. Twelve kilometres before Karimabad there is an 8 kilometre downhill free fall with magnificent views over the gorge. Just before the bridge, you can see your destination precariously perched on the other side of the cliff. From here, there is a tough 2 kilometre climb through the village of Ganish before the turnoff to Karimabad, where you will need to start really grinding the gears to get up the next 1.8 kilometres, around two hairpins to reach the top. It is a muscle-zapping, energy- taxing end to the days journey. Karimabad (52km; 854m), also known by its ancient title, Baltit, is the Hunza capital and nowadays survives quite nicely on the tourist trade. There are numerous hotels and restaurants and we choose one of the more budget options: Haider Inn. Rumour has it that the owner originally called this place the Old Hunza Inn, but didn't register it, so the man one door down snatched the title from under his nose. While we are reasonably satisfied with our triple room accommodation with attached bathroom and piping hot water for 200 rupees a night, the evening meal at Old Hunza Inn is a little better than here. Meals served during the day from the Haider Inn menu are, on the other hand, delicious and extremely good value for money. 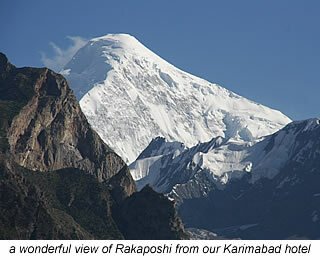 The area has some of the most spectacular snowcapped mountain peaks you will ever see. They just keep sticking out of massive ranges everywhere you look. These are some of the highest mountains in the world and hence there are numerous treks, from one day to much longer, to take from this point. It goes without saying that the place is brimming with hiking and climbing gurus all with a tale or two to tell. We are another kettle of fish, tending to rest-up in these places, rather than over-exert the body by walking up and down mountains all day. A visit to Baltit Fort, Ganish Village, a few kilometres on the bike or a day's wander along the canals is about as much as we add to our daily "must-do" list. For the rest, we quite contently admire the view from a stationary position. There is another suicide bomb attempt in Islamabad; again at the Red Mosque, which the authorities in all their wisdom decided to paint yellow. It is very close to where we had intended to stay, so we sit put in Karimabad for a little while longer and wait to see what eventuates. Besides, the view of Rakaposhi from our room is too good to give up just yet and there is enough to keep ourselves busy for the length of the stay. And no, we won't be nursing a hangover after the 1 year on-the-road cycle touring celebration on the 31st. A small can of Chinese beer, surprisingly enough obtainable here, will set you back about €3.20. More than we pay for a night in our hotel. And what's more, you have to take it from us: Chinese beer is really not worth it.